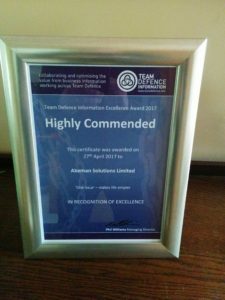 At the end of April One Issue was awarded ‘Highly Commended’ status by the judges for the Team Defence Information Excellence Award 2017 at the Defence Information ’17 Symposium – held at the UK Defence Academy Shrivenham (Cranfield University). The Team Defence information Excellence Award 2017 is keenly supported by the MOD who, along with Industry, recognise the value of learning from innovative joint endeavours involving companies of all sizes – from Defence primes to the smallest micro-businesses. One Issue was particularly praised for its overall simplicity, obvious value in eliminating wasted effort and clear user feedback. We would like to thank the judges – Lt Col Rev Bolam (Directorate of Logistics Information), Mr Rick Bounsall (Niteworks) and Mr Ross Harris (Senior Lecturer, Cranfield University) for their interest and insights. We look forward to further demonstrating these benefits to defence users in the near future. Contact us to discover how we can make your life simpler. 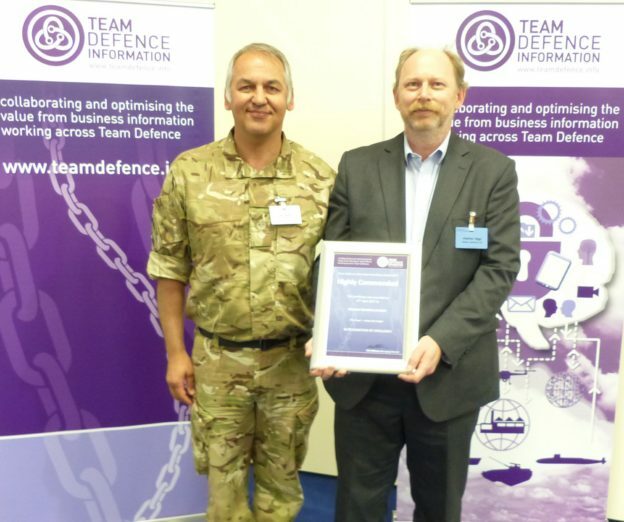 The overall award winner was ToolsGroup UK for transforming a lifesaving and mission critical supply chain across emergency services, including Defence. One Issue faced strong competition from established teams from defence industry organisations – but the simplicity and effectiveness of One Issue was clear to the judges. The feedback from symposium attendees was also universally positive – including many from both the MOD and prime contractor organisations. Contact us to discover how One Issue can make your issue reporting and resolution simpler. This entry was posted in Innovation, One Issue and tagged Accountability, Accuracy, Excellence Award, Reporting, Simplicity, Visibility on May 5, 2017 by Andy Hogg.